Fruit Salad – yummy, yummy – Helen, Naturally! For those of you that have the “Wiggles” song stuck in your head now – I am sorry! For those of you that have no idea who the “Wiggles” are – don’t Google them. It is a scary thing. I mean right up there with Barney & Teletubbies! If you do not know who Barney & the Teletubbies are – then you have obviously been living under a rock. Either that or you are very young, which means you probably shouldn’t be reading my blog anyway. But today is not able crazy people trying to entertain children with silly songs. Oh no, it is about fruit. Real fruit. Fruit that you buy at the farmer’s market. 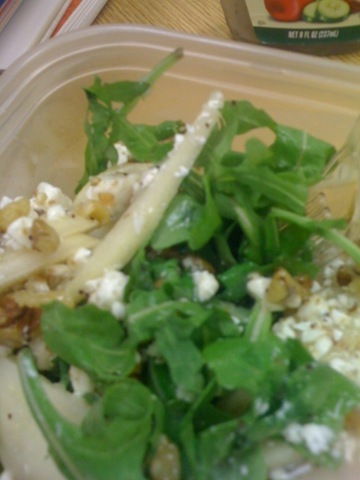 Today’s fruit salad contains: Arugula, pears, feta cheese, and walnuts. Did you guys think that I was making a “fruit salad” of various fruits mixed together? Yeah I thought maybe you did. While I do like to enjoy that type of fruit salad, I am picky. You see that has to be made right when I am going to eat it. I can’t do an all fruit salad that sits in the fridge overnight, then 1/2 of the day until my lunch…..no, no that will not do. 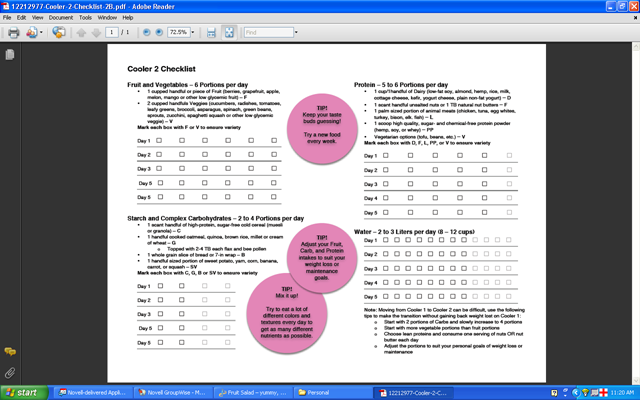 In my quest to “get back on track” I am tracking the foods and amounts that I am eating daily. My checklist contains all foods that are essential for a healthy and balanced diet. After my first several days, I realized that I am not consuming enough fruits. I am getting about one serving a day. ONE A Day! With about 2-3 servings of vegetables. The recommended number of fruit & veggie portions you should have daily is around six. I am so not close. This left me feeling drained and with a headache early on. So I figured a 3rd cup of coffee would help. As for the diet coke, well I drink one like every couple of months – no seriously like months! I wanted a treat after my rough morning – I gave myself one! I’ve been using the daily plate! 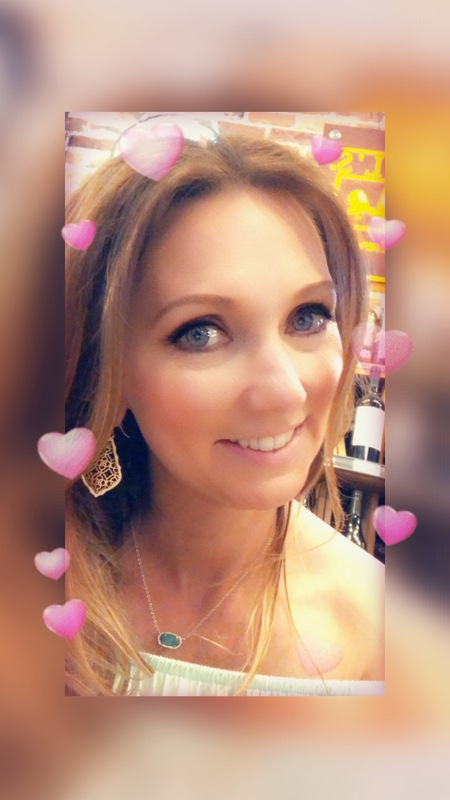 My snacking was out of control so it helps me eat real meals instead of just snacking ALL day! Oh I will have to check that one out! Yeah I had to endure the wiggles because of my siblings of course todays cartoons drive you crazy as well!